This dish is full of strong tastes and big chunks, which makes it much more interesting than the standard recipe, where every mouthful tastes much the same. Smoked dyed haddock is the traditional fish ingredient but in the past I have successfully mixed together white fish, salmon and mackerel. Thin fillets don't really work. Nor do kippers. Serve with crunchy garlic bread. We cook in two pans and serve from one of them. You will also need a baking tray and grill for the garlic bread. Cooking time = 5+15 minutes (or the time it takes for your favourite rice to cook). The secret of good timing is to decide when you want to eat then count backwards, starting each ingredient at its individual cooking time. Then everything is ready at once, which is as it should be. In our house the rice takes longest so is started first. These quantities feed two people. If you are feeding a houseful, double up, and up again, and use bigger pans. Half-fill a large pan with salted cold water, measure in the rice, turn up the heat and stir once or twice. Peel and trim the shallots and half-onion. Leave the rooted ends joined. Cut the shallots into two (down, not across, to keep the sections joined), cut the half onion into eight, leaving each section joined at one end. When the water is boiling, set your timer for the cooking time of the rice (mine is usually 12 minutes) stir the rice again and turn down to a gentle simmer. Put a tablespoon of olive oil and a knob of butter into a big frying pan or wok. When hot, slide in the onions and shallots to start frying. Wipe and slice the mushrooms, and add them to the shallots. Stir them carefully and modify the heat so that everything gradually crisps gently but nothing burns. Wash the eggshells and drop the eggs into the simmering rice. Skin the fish, roll up the skin and any little bones in the wrapper and put it in the freezer until your next bin day (we call these 'frozen nasties' and it is a good way of storing smelly discards). Check the shallots and turn over the chunks. Pull the fish apart until it is small enough fit in the pan. Lay the pieces across the top of the rice and press gently down into the water. No need to cover. Check the shallots and turn over the chunks. They should be golden by now. Red onions and shallots burn suddenly so modify the heat. Switch on your grill, mix garlic paste or garlic pickle into some soft butter, spread onto both sides of thick slices of white bread (this is a good way to use up stale bread), lay them on a baking tray and toast them under the grill. Turn over after two minutes. Switch off the grill (the residual heat should brown the upper sides and if you forget at this point they will burn). When the timer goes off, lift the eggs out of the pan and put them into cold water so you can handle them later. 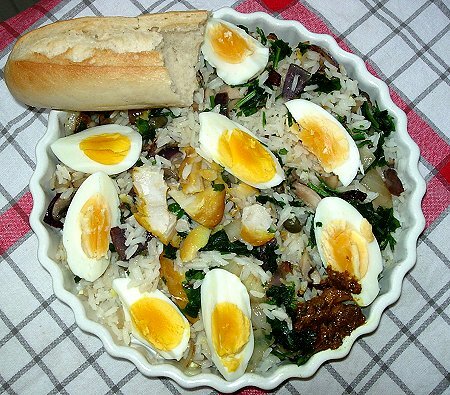 Drain the rice and fish and tip it into the frying pan, on top of the crisply brown shallots, onions and mushrooms. Add lots of ground black pepper, probably some salt (up to you), two teasp of lemon juice. Stir gently, lift and mix until you can see some of everything. Let the fish break into pieces. Turn off the heat. Sprinkle a big handful of chopped fresh parsley on top. Peel the hardboiled eggs, cut each into two, and put on top. Take the pan to the table, with the garlic bread.